the BCI rules mandate that any promotion in the form of circulars, advertisements, touts, personal communications, interviews, etc should not be done. Relevant rules can be accessed here. here, how several of the law firms are in blatant violation of this rule. Even after this was brought to the attention of the BCI, no action has been taken either to clamp down those who flout the regulations or to recognise the changing nature of the ‘noble’ legal profession and relax the rules against advertising. 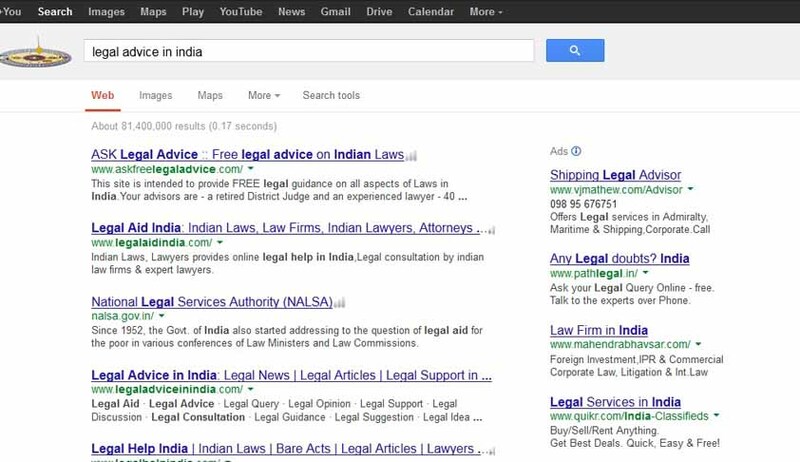 Live Law investigation has found out that many law firms are continuing to flout the BCI norms and are now openly advertising using Google Ads. Relevant screen shots of various ads that we have come across are available below. Speaking to Live Law, BCI Chairman Manan Kumar Mishra said, “We have taken note of this. Very soon be will be convening a meeting with all the law firms and discussing this.” He refused to comment further. It is high time that the BCI gave a serious consideration this contentious issue and take a concrete step in this regard.